Stories make us assimilate learning easier. Stories coming from the Icons and Beacons of Marketing is an opportunity to learn and a privilege to actually have a tete-a-tete with these speakers during the learning session! 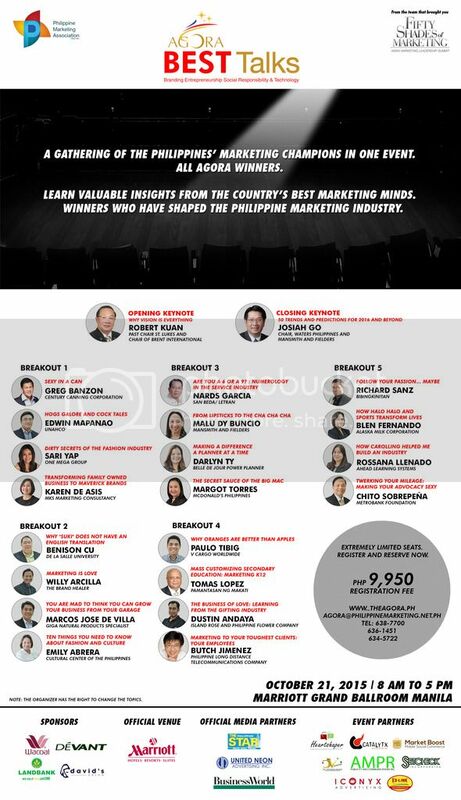 Join the inaugural offer of Philippine Marketing Association’s Agora BEST Talks. Learn from the BEST of the best in the Marketing Industry. From 50 Shades of Marketing to 50 Shades of Marketing- Darker, the Philippine Marketing Association brings together 22 past AGORA Awardees to share their experience, learning, passion, triumphs and tests on Branding. Entrepreneurship. Social Responsibility. Technology. Join us on OCTOBER 21, 2015 at the Marriott Grand Ballroom from 8AM to 5PM. Check our website- theagora.ph. REGISTER now. Limited Slots only.